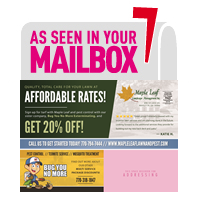 Maple Leaf Lawn Care Referral Program. Refer a client and receive up to $25.00 cash reward and your referral will receive a FREE Lawn Application. The best source we have to attract new customers is YOU! That's right. We depend on satisfied customers to spread the word to their neighbors, co-workers and friends. And when you do, we want to reward and thank you! Our Rewards Referral Program is easy and will save you valuable dollars on your lawn care. Simply spread the word to your neighbors, coworkers or friends of our great service and savings. When they call our office tell them to mention that you referred them or for their convenience they may request a Free Estimate Online. And when they start a new lawn care program with us, you will receive up to $25.00 cash reward and your referral will receive a FREE Lawn Application. It's that simple! As always, your positive words about our company and your tremendous efforts are graciously appreciated. We appreciate your loyalty and patronage and we look forward to starting our 15th year in business together with you! Referrals must live within our service area and cannot already be a customer. Referrals receive a FREE Lawn Application when they sign up for our 7 Step Lawn Care Program or a 10% discount when they sign up for 2 or more lawn applications. Referrer receives $25 in cash when their referral signs up for our 7 Step Lawn Care Program or $10 in Rewards when their referral signs up for 2 or more applications. Have fun and Happy Referring!